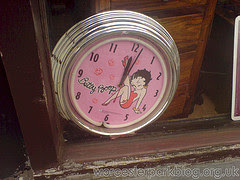 The death of the Betty Boop shop on Central Road ('Treasure Trove' to give it its proper title) has been announced many times before - I believe this shop, along with Mike's Music Store have been 'Closing Down' on several occasions in the past, only to remain distinctly open. But the writing may finally be on the wall for Treasure Trove, if a planning application to turn the premises into a restaurant gets the go ahead. If permission is granted Worcester Park will have, I understand, its first Persian restaurant, which will be an interesting addition to our neighbourhood. Meanwhile 'Hair By Fiko' next to the station is opening next week - official opening is Thursday morning but you can join Fiko and the gang for drinks and nibbles on Wednesday 27th Feb from 4pm to 7pm if you fancy a sniff round the salon. I'm sure many a weary commuter will succomb to the offer of free wine on their way home. "Your blog is very, very funny and highly informative. It is one of the best blogs I have come across and I think it should be serialised on Radio 4. Under no circumstances cease!" Well, you're too kind. Radio Jackie, maybe - but if Radio 4 are reading this do get in touch. 'Under no circumstances cease' sounds incredibly posh if you don't mind me saying. Clearly one of my readers from the 'clean air' side of the low emmisions zone. And with that, I bid you good day gentlemen.